I tried to like this series. I slogged through the first two books (The Lightstone, The Silver Sword) and I gave this one 250 pages but I had to give it up. 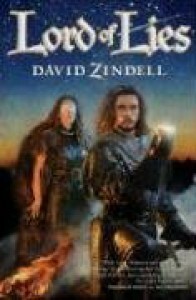 I remember reading Zindell's first novel, Neverness, soon after it came out and not being terribly impressed so I never picked up any of his other stuff until I came across The Lightstone on one of my libraries' New Book shelf. The jacket blurb sounded intriguing, and an epic fantasy based more on a Buddhist worldview than the Medieval/Christian one found in most books (the savior figure is even called the "maitreya") interested me. But the execution is awful. The reader is constantly being torn away from immersion in the book by clunky exposition and the characters tend to speak in sermons. I have more potentially interesting books on my shelf than to continue with this one.